When a manufacturer like Ford brings out a substantially new group of heavy duty pickup trucks, you can be sure in advance that they will be put through their paces and compared with the competition in a virtual roundup of driving activities. Earlier this week in a rugged part of West Virginia, almost two hours from the state capital of Charleston, I had an opportunity to drive the new 2015 Super Duty trucks — F-250, F-350 and F-450 — that feature a new engine, a range of new features and new interior options. I was duly impressed. The mountainous terrain was impressive and a full day of driving rain made sure that we were towing and hauling large loads in real world conditions. While there were no boats to tow, large RVs were provided for the F-350 duallies, flatbed trailers with maximum loads of cement blocks were used for the F-450s (commercial driver’s license required), and F-250 trucks had 1,000 lbs. of product in the bed. Chevrolet Silverado and RAM trucks were the competitive vehicles and, unlike some driving events that I have been to before, they were matched as closely as possible to their Ford counterparts so that genuine comparisons could be made. Let me say at this point that every truck performed well. In this category of vehicles there are only three players in North America, no clunkers and there will always be preferences among truck buyers as to their individual preference. Available across all models, the new Super Duty trucks boast an available 6.7-liter Power Stroke V8 Turbo Diesel, the second generation of this very popular engine. The new iteration boasts 440-horsepower, up from 400-horsepower, and 860 lb.-ft. of torque, increased from the 800 lb.-ft. on the previous 6.7-liter. 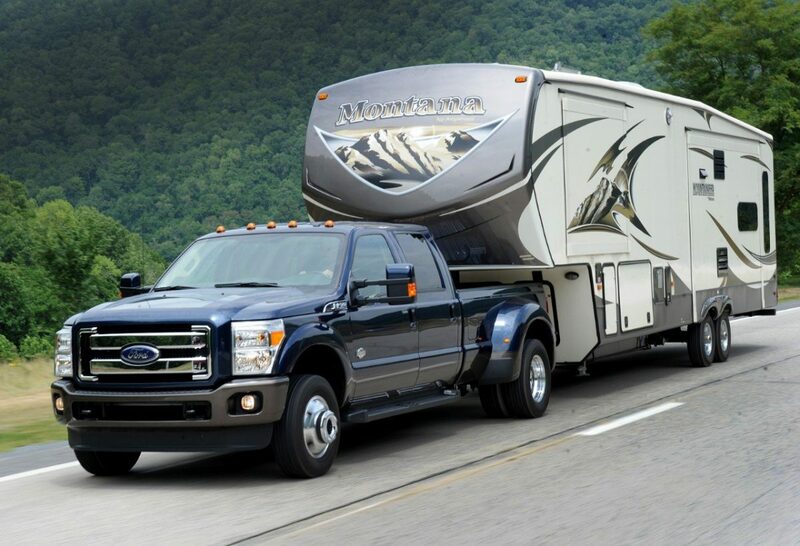 The F-450 has maximum fifth wheel/gooseneck towing capability of 31,200 lbs., which Ford describes as class leading. This is a gain of 6,500 of tow capacity from the previous F-450. The truck’s gross combined weight rating is 4,500 lbs. higher at 35,000 lbs. Since this is primarily a work vehicle, the added capacity means fewer runs for measurable efficiency which translates to a cost benefit. On the F-450, Ford has also specified commercial-grade wheels, tires and brakes, upgraded U-joints and suspension. Here’s a fun fact for you: the 40,000-lb. combined weight of the properly-equipped F-450 with its trailer and load capacity is half the maximum weight of a semitrailer on most Federal interstate highways. Maximum fifth-wheel/gooseneck towing capacity has also increased on the F-350 with a high-capacity tow package, with specs rising from 23,200 lbs. to 26,700 pounds, and gross combined weight rating up 4,500 lbs. to 35,000 lbs. All of the vehicles I drove had the new 6.7-liter engine, while the standard for these vehicles is the 6.2-liter gasoline V8. 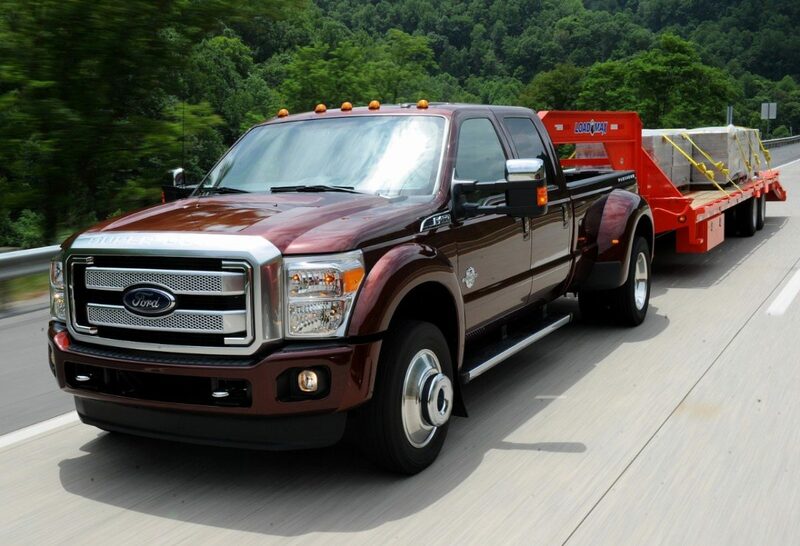 I recommend that — if a new Super Duty is in your future — you should opt for the diesel with its increased capabilities. Many sportsmen tell me that, even though their current needs don’t require the larger engine, they always buy their tow vehicles with an eye to that bigger boat that is on their wish list. This engine has a compacted graphite iron engine block which helps reduce weight and increase strength,, and a reverse-flow layout that places the exhaust inside the engine’s V-shape with the air intake positioned on the outside. The modifications allow shorter airflow from the exhaust system to the new, larger turbocharger that improves turbo responsiveness. Positioning the turbo inside the engine’s valley also helps to isolate the engine’s hottest temperatures to improve performance while reducing noise, vibration and harshness (NVH) for a quieter cabin and driver/passenger comfort. Engine braking is also improved. Manually controlled by a push button on the dashboard, this extra braking power helps reduce wear on wheel brakes and requires less manual brake application from the driver on downhill grades. New injector tips spray a higher flow of atomized fuel into the cylinders for a more complete burn, less NVH and more power. The changes also yield reduced emissions and less fuel deposit buildup on the intake valves. The engine is mated with a six-speed automatic transmission for both the 6.7-liter and 6.2-liter gasoline V8. 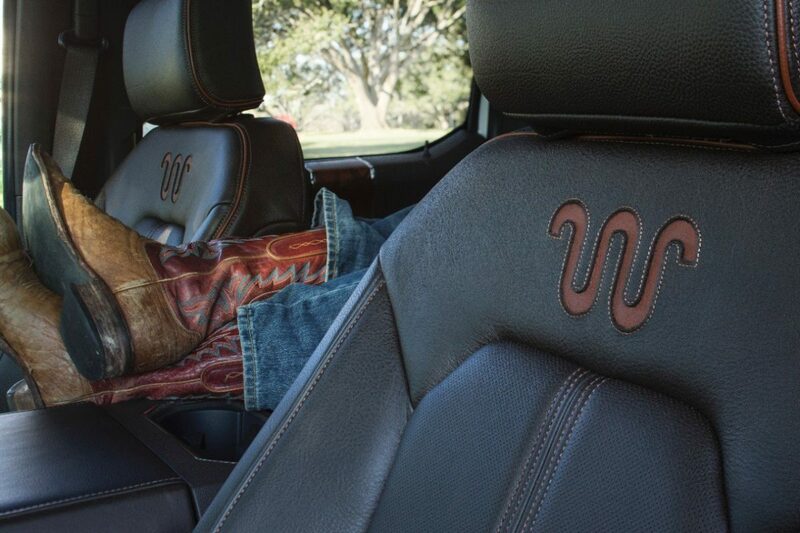 There are five trim packages available for the 2015 Super Duty lineup — the XL, XLT, Lariat, King Ranch and Platinum. 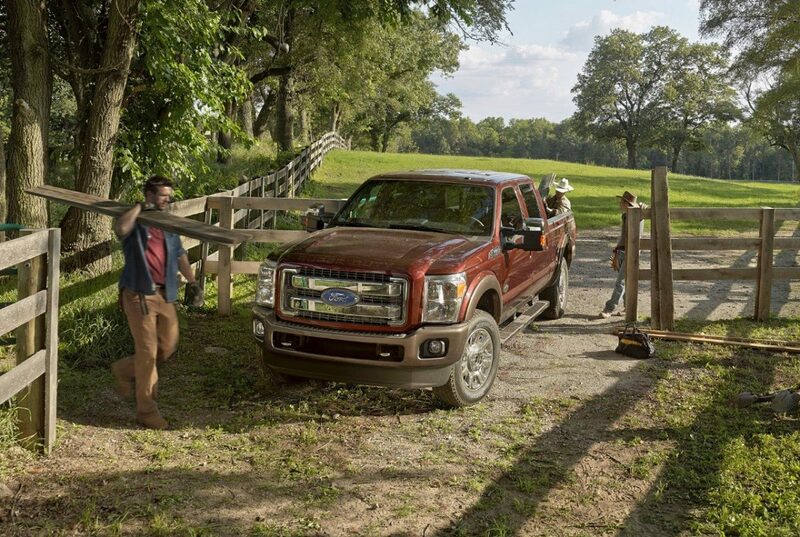 Check the build-your-truck feature on the Ford consumer website (www.ford.com) to see which features — standard and optional — are available for the configuration that interests you. The regular cab, for example is available only in the XL and XLT models, which makes perfect sense. 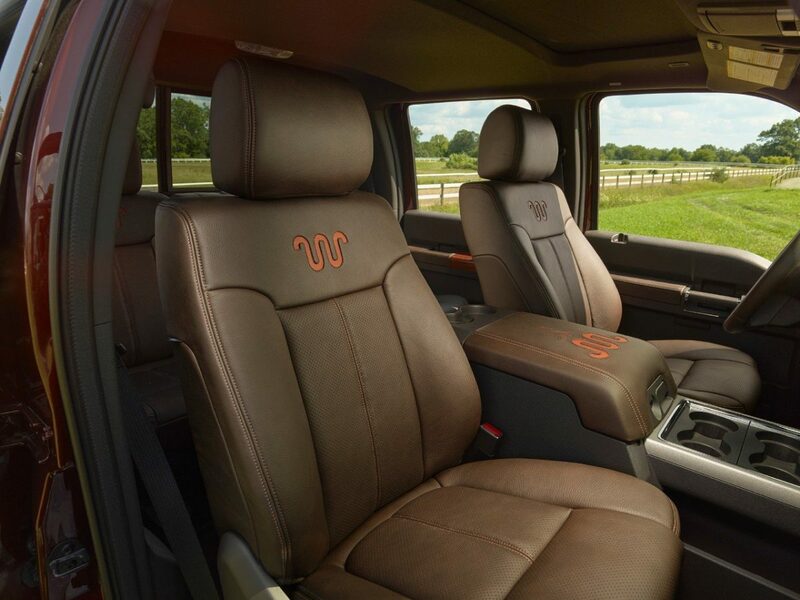 While most interior and exterior features are a carryover from the 2014 Super Duty model, but there are some additions to write home about. The King Ranch Edition has been updated on the inside with a new leather color — mesa brown — and curly maple woodgrain as an accent. The running W brand continues to define it on seat backs and badging. Safety features that have been added for 2015 include AdvanceTrac with roll stability control (on single-rear-wheel axle only), MyKey programmable vehicle key, energy management system pretensioning for height adjustment on front row safety belts, and lower anchors/tether anchors for children. One major interior change is the obviously-quieter cabin. 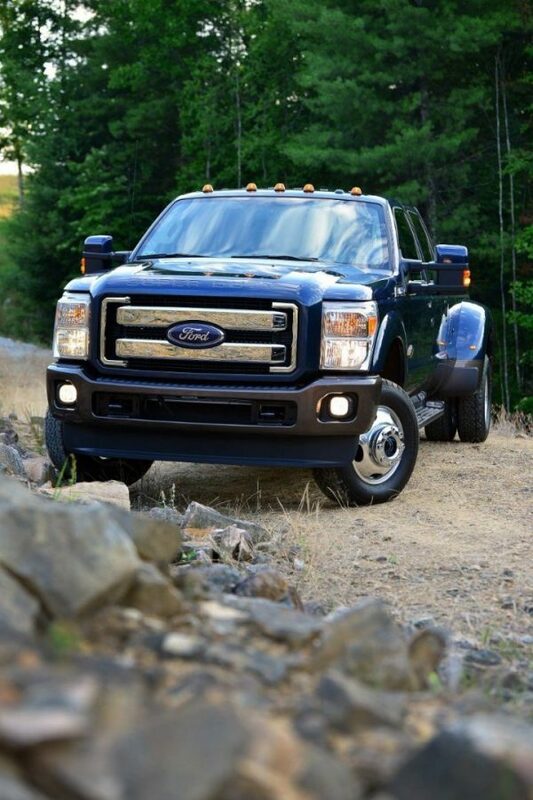 I am seeing it everywhere in the truck industry, but on the Ford Super Duty it is dramatic. If you want a noisy large pickup truck, buy an old one because you won’t find much engine or road noise here. On the exterior, side molding, grilles, exclusive wheels and other features create good visual distinction between models. just as you would expect from this important group of products. Recognizing the demand for Bluetooth, infotainment, navigation and other electronic features, Ford has included MyFord Touch and Sync in its Super Duty trucks. Everything is easy to access and any complaints about the earlier iterations have been addressed. Even if you didn’t like it before, it’s worth a trip to the dealership to try out the most recent edition. I genuinely enjoyed my time in the 2015 Super Duty trucks. They took the hilly terrain of West Virginia without any effort whether they were without any load, were towing large trailers or were transporting substantial loads on flatbed trailers. Ford truck lovers and those who crave high performance capability and comfort will not be disappointed. It’s only fair to report that Ford had only King Ranch and Platinum edition vehicles at our drive event, but that should be no surprise since manufacturers want use to drive vehicles with the most features and distinctive interiors. I can’t complain.